District first mentioned in the Old Testament as a Joktanite or south-Arabian tribe (Gen. x. 29 et seq. ), and later as the port of destination of Solomon's fleet. The earliest reference to Ophir in this connection is in I Kings ix. 26 et seq. (= II Chron. viii. 17 et seq. ), where it is said that King Solomon built a navy of ships in Ezion-geber, near Eloth on the Ælanitic Gulf in the Red Sea, manned them with the expert crew given him by Hiram, and sent them to Ophir, whence they brought him 420 talents of gold. A later reference (ib. x. 11 et seq.= II Chron. ix. 10 et seq.) says that the navy of Hiram (or of Solomon) brought back from Ophir "great plenty of almug-trees and precious stones." From that time Ophir was to the Hebrews the land of gold par excellence (comp. Isa. xiii. 12; Ps. xlv. 10 [A. V. 9]; Job xxii. 24, xxviii. 16; I Chron. xxix. 4). The Septuagint renders the name in Gen. x. by Οὐφείρ, but in other passages by Σουφείρ, Σωφείρ, Σωφείρá, Σωφείρα, etc., while Josephus writes Σώφειρα. The land of Ophir has been assigned to the most various points of the compass, including Armenia, South Africa, Arabia, the West Indies, Peru, the coast of India, Spain, and Ceylon. Only a few of these identifications, however, deserve serious consideration. Reland, Lassen, the geographer Ritter, and others place Ophir in India, near the mouth of the Indus, equating the word with the Sanskrit "Abhira" (the name of a shepherd tribe) and the "Aberia" of Ptolemy. Others identify it with the port Σοήπαρα mentioned by Ptolemy, the Οὔππαρα of Arrian. 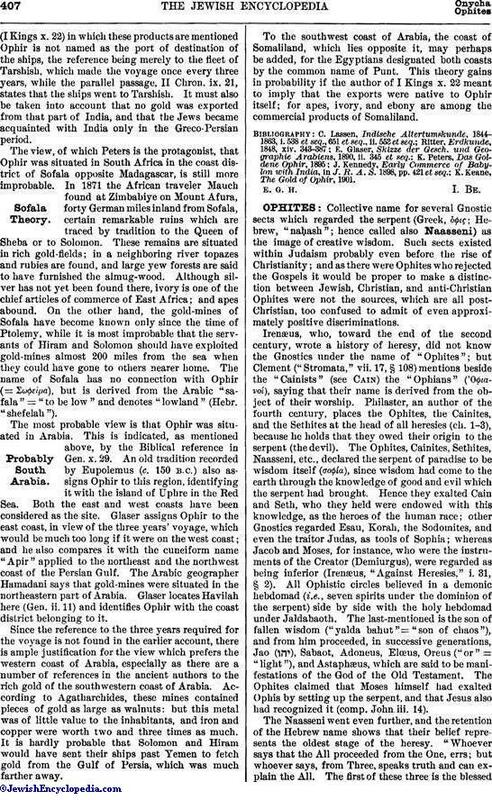 Although the name Σώφειρα in the Septuagint and in Josephus designates a part of India proper, as may be shown from Coptic vocabularies, this merely proves that Josephus and others identified Ophir with India, basing their conclusions on the fact that at that time India was regarded as the land of gold. Still less convincing is the argument that the exports from Ophir were of Indian origin, a view based on I Kings x. 22, which says that in addition to gold and silver the ships brought also "habbim," "ḳopim," and "tukkiyim." The renderings "ivory," "apes," and "peacocks," and the view that these terms are loan-words from the Sanskrit, are very doubtful; and the same criticism applies to the purely conjectural translation of "almuggim" as "sandal-wood" (see Algum). Moreover, in the only passage(I Kings x. 22) in which these products are mentioned Ophir is not named as the port of destination of the ships, the reference being merely to the fleet of Tarshish, which made the voyage once every three years, while the parallel passage, II Chron. ix. 21, states that the ships went to Tarshish. It must also be taken into account that no gold was exported from that part of India, and that the Jews became acquainted with India only in the Greco-Persian period. The view, of which Peters is the protagonist, that Ophir was situated in South Africa in the coast district of Sofala opposite Madagascar, is still more improbable. In 1871 the African traveler Mauch found at Zimbabiye on Mount Afura, forty German miles inland from Sofala, certain remarkable ruins which are traced by tradition to the Queen of Sheba or to Solomon. These remains are situated in rich gold-fields; in a neighboring river topazes and rubies are found, and large yew forests are said to have furnished the almug-wood. Although silver has not yet been found there, ivory is one of the chief articles of commerce of East Africa; and apes abound. On the other hand, the gold-mines of Sofala have become known only since the time of Ptolemy, while it is most improbable that the servants of Hiram and Solomon should have exploited gold-mines almost 200 miles from the sea when they could have gone to others nearer home. The name of Sofala has no connection with Ophir (= Σωφείρα), but is derived from the Arabic "safala" = "to be low" and denotes "lowland" (Hebr. "shefelah"). The most probable view is that Ophir was situated in Arabia. This is indicated, as mentioned above, by the Biblical reference in Gen. x. 29. An old tradition recorded by Eupolemus (c. 150 B.C.) also assigns Ophir to this region, identifying it with the island of Uphre in the Red Sea. Both the east and west coasts have been considered as the site. Glaser assigns Ophir to the east coast, in view of the three years' voyage, which would be much too long if it were on the west coast; and he also compares it with the cunciform name "Apir" applied to the northeast and the northwest coast of the Persian Gulf. The Arabic geographer Hamadani says that gold-mines were situated in the northeastern part of Arabia. 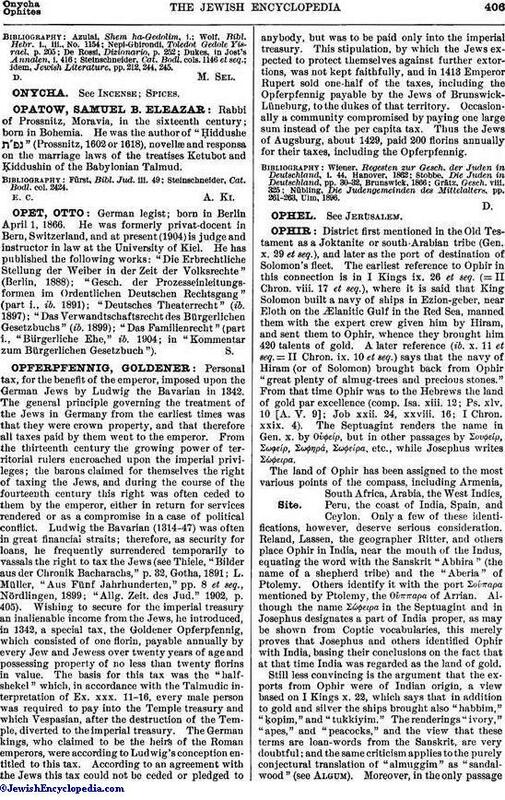 Glaser locates Havilah here (Gen. ii. 11) and identifies Ophir with the coast district belonging to it. Since the reference to the three years required for the voyage is not found in the earlier account, there is ample justification for the view which prefers the western coast of Arabia, especially as there are a number of references in the ancient authors to the rich gold of the southwestern coast of Arabia. According to Agatharchides, these mines contained pieces of gold as large as walnuts: but this metal was of little value to the inhabitants, and iron and copper were worth two and three times as much. It is hardly probable that Solomon and Hiram would have sent their ships past Yemen to fetch gold from the Gulf of Persia, which was much farther away. To the southwest coast of Arabia, the coast of Somaliland, which lies opposite it, may perhaps be added, for the Egyptians designated both coasts by the common name of Punt. This theory gains in probability if the author of I Kings x. 22 meant to imply that the exports were native to Ophir itself; for apes, ivory, and ebony are among the commercial products of Somaliland. K. Keane, The Gold of Ophir, 1901.